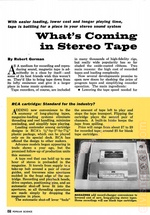 Stereo - seems to be the driving force behind the creation of the tape cartridge magazine. 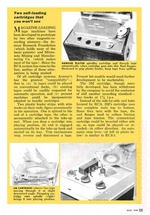 According to an article printed in the June 1959 issue of Popular Science, the once strong tape market was losing market share with the introduction of the lower-cost, single-groove stereo disc. 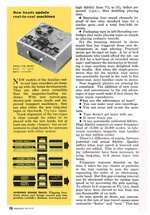 To correct market share, the tape cartridge magazine became the lower cost solution to the traditional tape market. 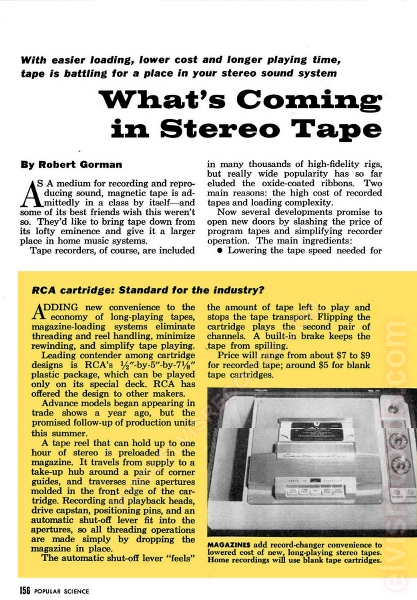 There were three driving factors for lowering the price of tapes and simplifying recorder operations. 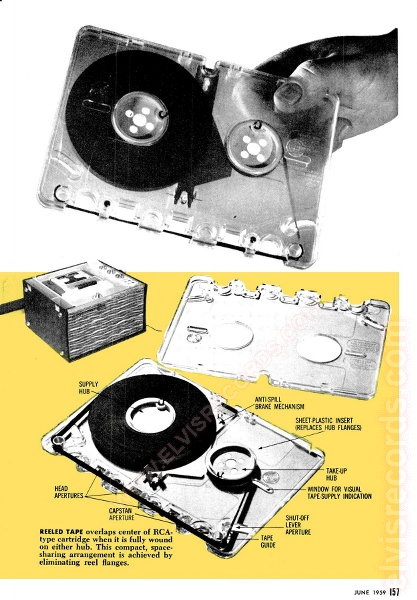 Lower the tape speed for high fidelity from 7 1/2 to 3 3/4 inches per second (i.p.s. 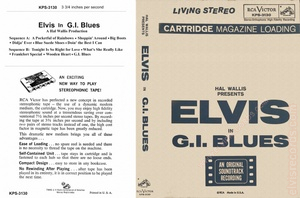 ), doubling playing time. 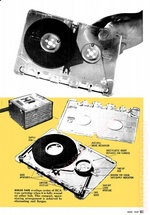 Squeeze four sound channels instead of two onto standard tape for a similar gain - and a total four-fold increase. 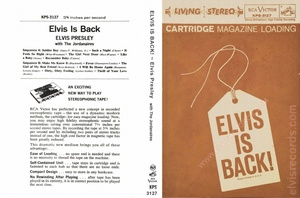 Package tape in self-threading cartridges that make playing tapes as simple as playing ordinary records. 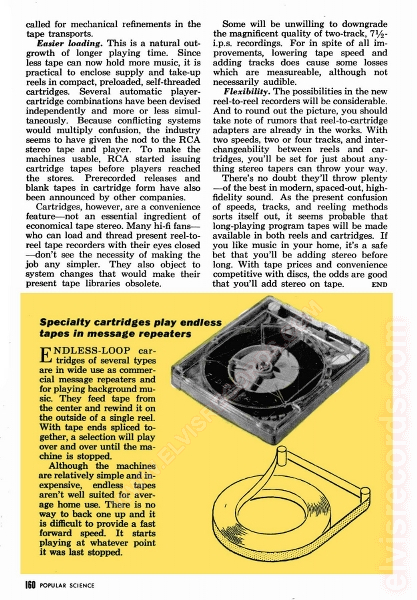 Additionally, tape introduced certain advantages over the disc. 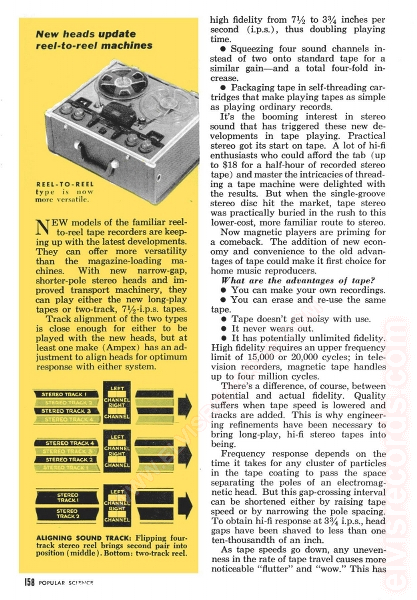 Tape doesn't get noisy with use. 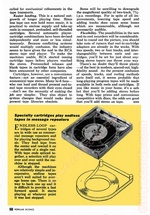 It has potentially unlimited fidelity. 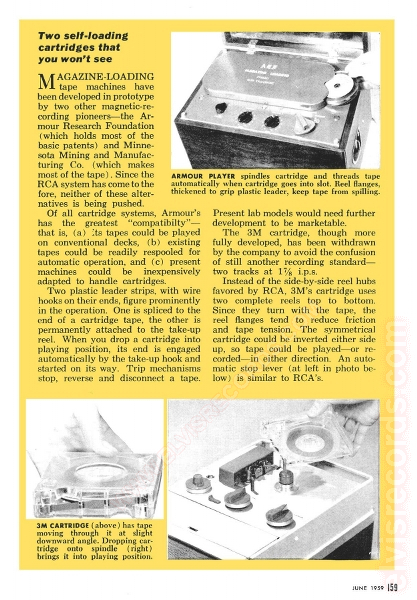 Further implications for this format, included video reproduction, automobile cartridge players, and tape rental services. 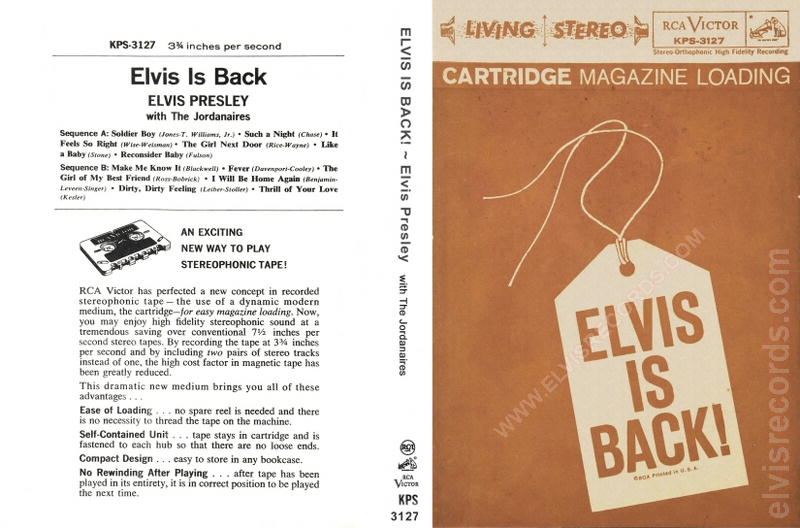 This is not all conclusive, however, scanning through the mid-1960s issues of Billboard, it would appear that the tape elvolution to the 8-track tape or Stereo 8 tapes would have brought the tape cartridge magazine to an end. 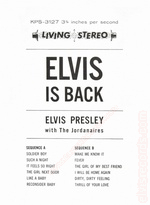 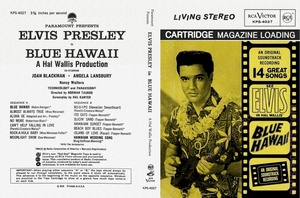 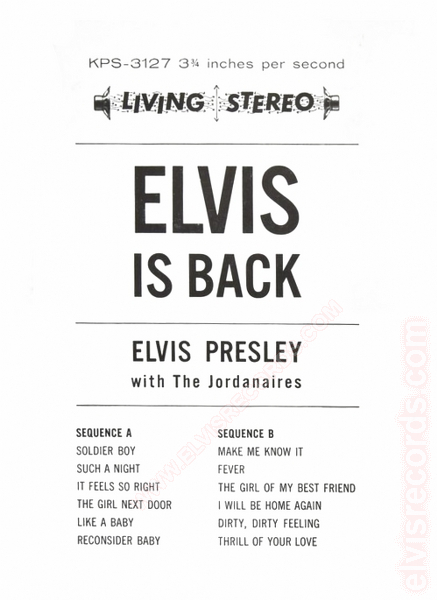 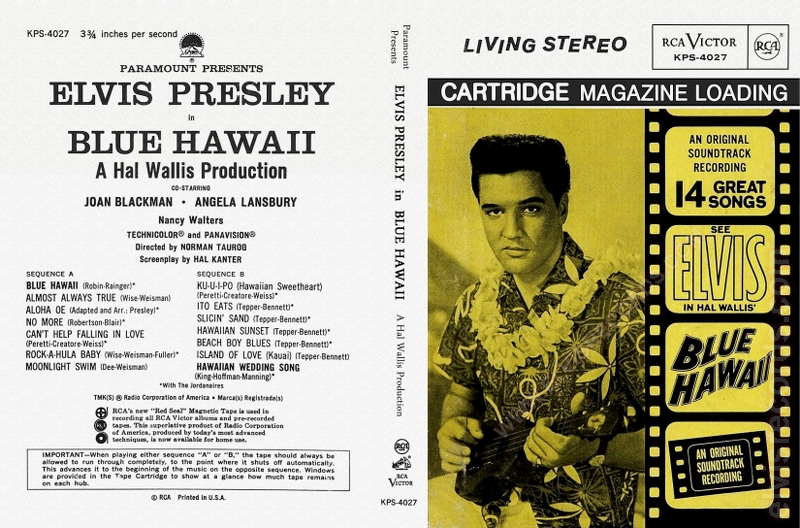 On this short lived tape format, RCA Victor produced three confirmed Elvis releases. 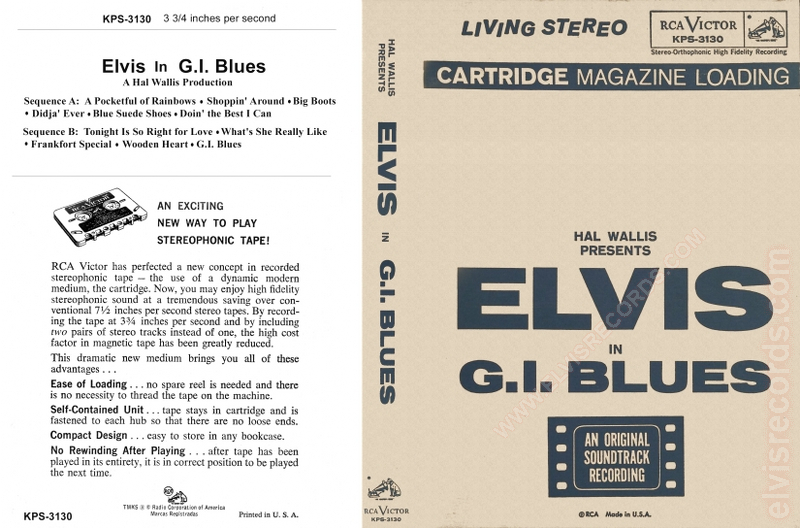 Each of the images below have been painstakingly reproduced from material from several sources2 to get that fresh new look.